A long, long time ago, I was an exchange student. I went from the safe enclave of an upper-middle class American town to the exotic and slightly scary world of Tunisia. It was 1973. I knew nothing about Tunisia, or about Islam, and I found myself thrust into an absolutely exotic and entrancing world, filled with mystery and wonder. Luckily for me, I went very quickly from the world of “Casablanca” to the world of “Nice middle class family”. Although I was inspired and amazed by the sounds and sights of the Minarets, by the beauty of the ancient mosques, and by the exotic perfumes of the jasmine blossoms, I was also made aware of the universality of familial and cultural love. While I was living in Tunisia, I noticed the prevalence of the “khamsa” symbol; a hand held up in benediction, bringing a wish for love and peace. The khamsa is a woman’s blessing. 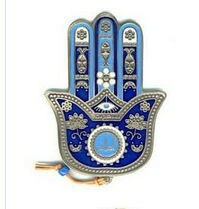 I was told by my Islamic Tunisian friends that the symbol represented “the hand of Fatma, the daughter of Mohammed”. I loved the idea of the holy woman, bringing her gentle guidance to the people with her upheld hand. When I came back from my summer in Tunisia, I carried a “khamsa” decorated dish, which I have proudly displayed for 41 years. I have since read that the “khamsa” is a symbol that was recognized by very early Christians, who called it “The hand of Mary.” Amazing. As a mother, I absolutely love the idea of the woman’s blessing. I love that it transcends the so-called differences between the great religions. If I ever had a “totem”, this would be it. About ten years ago, I came home from work one day. I pulled into my driveway, grabbed my bag of school work, and stepped out of the car. At my feet, I found a tiny, perfectly shaped, rubber “khamsa”. I picked it up, held it in my hand, gasped in surprise. Where had it come from? I placed it carefully in the front window of my house. It stayed there for a very long time. A mysterious and powerful message of love and peace and blessings. Two years ago, on my birthday, my daughter bought me a beautiful silver “khamsa” necklace. It holds my birthstone in the center of its palm. I wore my khamsa to school this week. I wore it because I love its message. On the second day of school, I was standing in my classroom with about 12 kids who were heading home on Bus #3, my assigned “busroom”. We were all lined up, waiting patiently for our ride home. A tiny little first-grade girl, born in Nigeria, reached up to touch my “khamsa” with her fingertip. “What is this thing?”, she asked, her bright yellow hair ribbons bobbing. She was frowning in concentration, and her beautiful little face was filled with concern. I told her, and the other children in line behind her, all about the khamsa. I stood still, thinking that this information was most likely beyond the comprehension of my smallest charges. Then a little voice chimed in, “Oh, I get it!”, she cried with excitement. She was a tiny little blondie, the friend of her Nigerian classmate. Her bright blue eyes lit up, and her dimpled cheeks were stretched out with a smile. She reached out one little finger, and placed it in the heart of my “khamsa” necklace. I was speechless. I didn’t know how to respond to such a lovely gift. Salaam, shalom, peace, mir, pax, etc. May the spirit of the “khamsa” be with you and yours. I read this last night but was too tired to respond coherently–but really, this is lovely. I wonder if you’d think of getting it published elsewhere? It’s a message many need to read. Thank you! I was so tired when I wrote it that I wasn’t sure it was even coherent! I’d love to have it published, but have no idea of where, or how to go about it. Do you have any idea? Well, in the online world something like Huffington Post comes to mind, as they have a big audience. Or there’s Midlife Boulevard, an online newsmagazine for women of midlife–I know their editor is always looking for new work. Thanks!! I’ll give it a try! We learned about the khamsa symbol when we were in Morocco this past year. I did not know its significance in other forms of religion. How wonderful. What a keen & insightful little student you have in your midst. It sounds like she made your day! Oh, believe me, she made my year!!! I would love to see the khamsa symbol spread around the world. Time for some women’s blessings……. Those little kids were so astonishing…..how did they make that connection at five years old?! I would think that connection is obvious. I made it and I’m only three-and-a-half! A lovely reminder that on any given day, each of us can be Fatma/Miriam/Mary to someone. I’m shocked you can talk about “giving a blessing” in a public school without getting fired! Our school manages to hold on to some progressive ideas, and we acknowledge that there are religions. We’re just careful not to promote one over the others. Same with political parties, which is WAY harder for me!